In an election increasingly motivated by fear-rather than hope, the images of fear on digitized billboards profiling fugitives from federal laws is a terrifying echo of the prominence of danger in the mental imaginary, even before the disruption of the national by the arrival of anonymously sent pipe bombs across the eastern seaboard, sending waves of suspicion nationwide. And this air of suspicion provides a context in which the fears of migrants, and criminal elements who posed profound dangers to the nation, has continued to expand. The rise of anti-immigrant discourse has heightened anti-semitic incidents, and a new atmosphere of intolerance across the United States unprecedented in its intensity and open-ness. This landscape can indeed provide one context for the ghastly mass-murder of congregants in Pittsburg. 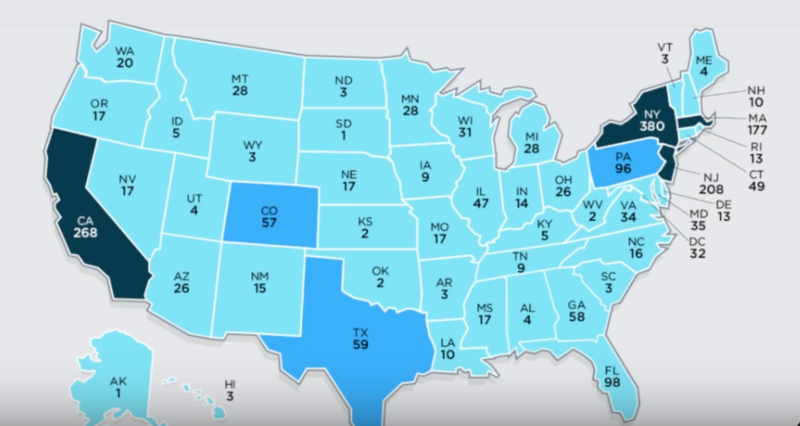 All fifty states have been affected in some what by the 1986 individual incidents of antisemitism counted in the United States occurring in 2017 that were tallied in a proprietary dataset in the annual audit of the Anti-Defamation League–numbers constituting unprecedented increase of 60% from the previous year and the greatest increase since the tally began in 1979–a proxy for the rending of our national fabric. The proprietary dataset compiled by the Anti-Defamation League to created an interactive “H.E.A.T.-map” –tallying the growing “heat” of anti-semitic incidents of hatred, extremism and terror multiplying in response to the anti-immigrant agenda of Donald Trump, to map the geographical distribution of White Supremacist propaganda and incidents, anti-semitic violence, and murders–to navigate among the over three thousand incidents of extremism or antisemitism over the past two years in the United States–a terrifying prospect, though one which can be seen as oddly removed from the triggers in Trumpian public speech or in the online diffusion of intolerance. But the mapping of such incidents, amazingly multiplying white supremacist rallies of belonging, white supremacist propaganda, and attacks on Jews that suggest a landscape of intolerance, may be unclear in mapping such an explosion of hatred within the territorial limits of the United States, so deeply has it been rooted in the xenophobia and anti-immigrant language of nativism that has been promoted and fostered from the start of his candidacy with incendiary statements about the “drug dealers, criminals, and rapists”the “drug dealers, criminals, and rapists” crossing our southern boundary, a desperate criminalization of immigration that was central to the campaign, and central to the criminalization of border-crossing in Trump’s America that has fostered a nativist agenda. These first specters have animated a few of the criminalized non-native immigrant that triggered and nourished intolerance, as specters of “illegal immigration” have triggered anti-immigrant movements and protests across the nation, of course, linked to increased in crimes, violent criminally, and a decrease in jobs, as well as monopolization of social services, in the past year alone–making 2017 one of the greatest years ever for white-supremacist incidents and other occasions of intolerance, which grew by half in the nation since the dawn of Trumpism, and at educational institutions from colleges to K-12 institutions has grown at an astounding rate nearing 90%–even if they were not bloody attacks, “private massacres are taking place” within our shores that change our political space, as ADL showed in a cool interactive map whose exploration allows one to examine the spread of white tolerant propaganda that divides our nation not rom Russia, but in our territorial bounds. The “audit” shows the growth of anti-semitic incidents in states with high Jewish populations–New York (380 incidents), California (268 incidents), New Jersey (208 incidents), Massachusetts (177), Florida (98), and Pennsylvania (96)–but the growth of white supremacist events as dovetailing with them elsewhere, as if lighting a fuse in the nation demanding to be mapped in detail. But the jump from social media “shitpiling” to opening fire or sending bombs on those named as agents undermining the nation is more than sick. The gravity of murder with assault rifles or mailing pipe bombs still, however, makes us pause. While we create monuments to remember the evil done to us, or in our political space, it seems hard to place a commemorative mark at a site for such incidents, and not only because the 57% rise in antisemitic incidents since the Trump campaign began or the multiplication of anti-semitic incidents at K-12 or college campuses at staggering rate of almost 90%. The broad targeting of immigrants, refugees, and leftists, people of color, and LGBTQ, is increasingly nourished by the adrenaline rush of online postings that unleashed something like coastal upwellings of online hatred, apparently concentrated near our coasts. But they have boiled up from dangerous weapons of mass distraction with a violence that strains credulity, by perpetrators who are not foreign, and the divisions not coming from outside but fostered online. 2. The crisis of mapping violence in the rampant diffusion of wartime violence that knew no division between the mapping of differences of civilian and military spaces, and revealed spaces that we “could quite believed could exist” and indeed challenged being able to be defined on a map, the English poet contemplated the surface of the map as an adequate to take stock of proliferating moral problems of reflection. If “Flags on a map assert that troops were sent,” the map is hardly able to capture the “private massacres taking place;/[as] All Women, Jews, the Rich, the Human Race” were threatened in World War II, and mechanized airplanes “can only see/ the breathing city as a target/which requires their skill” to drop bombs upon them. In this context, however, maps pointed at the sites “where life is evil now:/Nanking: Dachau“–a chilling rhyme by which, for W.H. Auden in In Time of War (1939), sites of real hell emerged on the paper map. –seems strikingly forgotten by a mist of memory in the spate of extreme right wing violence, even though it is utterly foreign to American history. Something quite distinctly evil, if less systematically evil, has occurred in the terrifying targeting of individuals out of a deeply distorted sense of danger, fear, and perceived threat, as acts of violence have spun out of imagined accusations against others cast as threats to the state in ways we have never seen, rooted in a rhetorical targeting of outsiders as alien to our way of life, and offering venues for hateful opposition or blame, that suggests that the alter-space of the internet, an idealistic space of open exchange, has become an ecosystem of the authority of the screen–an ecosystem that erases memorials, or the memory of hate, but through a new economy of sharing gives new legs to hate and calls for violence, able to reach audiences before whom they would have never penetrated, as they appear on their screens with unimaginable intensity. The terrifying tendency of platforms that are far removed from –and even that are “monitored,” as are both Facebook and Twitter, as well as the cheery platform of Instagram, as Sheera Frenkel, Mike Isaac, and Kate Conger have shown, trawling on the Facebook spin-off reveals over 12,000 anti-semitic posts by a few hateful hashtags: the efflorescence of antisemitism reveals how an ecosystem for sharing pictures has been able to hold the overflow of hate speech in the immediate aftermath of one platform being closed, as internet companies have so exploited the relation to and dependence on the screens in society to allow hate-speech to reach new audiences before it can be tracked, and until we have to play clean-up after the most tragic consequences of the violent impact of a rhetoric of hate. 3. The ratcheting up of fear of immigrants hardly warranted an attack with assault weapons, or a provocative mailing of pipe-bombs or use of assault rifles. But the spread of hate and extremism is put before our eyes in what seems all its gruesome detail in the H.E.A.T. (Hate, Extremism, Anti-Semitism, Terrorism) Map–an interactive “heat” map of the centers of intolerance–that was launched by the ADL on the anniversary of the Charlottesville Rally of White Supremacists the hot summer of this past August. 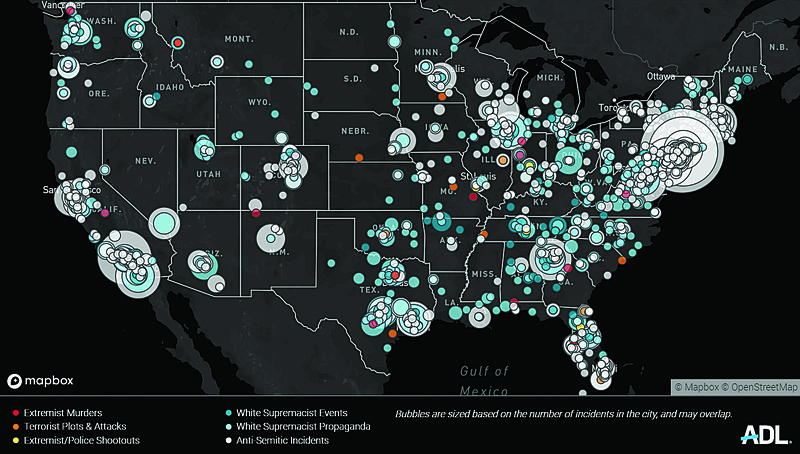 The map–a bubble-chart of the intensity of 4,800 data points of the ADL’s proprietary design, suggested a terrifying amping up of white supremacist and anti-semitic attacks both in recent years–the past two years have seen record growth in such incidents–in Texas, Georgia, Florida and across the south, as well as in Texas and the midwest, raising questions of how it can be countered or what fighting extremism means in a country where some 900 white supremacist incidents occurred since 2017. The map effectively poses the question of their relation to the true sites of violent murders, shoot-outs, or terrorism in red, yellow, and orange–the very questions posed in how one moves from rallies, white supremacist rhetoric, and claims on chat rooms and social media to heinous acts of violence such as ending pipe-bombs and the occurrence of the largest armed violent attack on Jews in American history. –as metropolitan cities across the midwest and eastern seaboard are shockingly prominent sites of antisemitic incidents or hate-crimes, and some terror plots, as well as rural areas are terrifyingly common as sites of antisemitism, and demand to be unpacked at lower scale. The disturbing ballooning of anti-semitic incidents map the tragic but still not fully understood confluence of the circulation between acts of verbal online defamation and openly violent acts that challenge accepted standards in their absence of humanity. Both recent terrible events were nourished by slanders that gained legs online–and that have not been stopped, even after they inspired the greatest mass-shooting of Jews in American history and the most horrific crime scenes in the United States, and the most horrific targeting Americans only because of their faith. The space of online platforms allow charges to circulate that recall utterly unsubstantiated nineteenth-century charges of Jews hurting the nation through aiding immigration of the “unfit” or “diseased,” but are now ratcheted up with an added terrifying nativist twist, as the focus on restoring concentration to “America” and its economy suggests a bizarrely self-absorption of seeing the plight of others through the lenses of national security. If the optic of 9/11 created an us v. them platform of suspicion, the events suggest that rather than seeing 9/11 as an isolated incident, it must be placed in continuum with the present, both as the most compelling site for relaunching conspiracy theories, and the alarms of vigilance against foreigners on our soil. –is reflected in a simple census showing the huge proliferation of prisons in America, which has done so much to change our public space, and in which the growth of the state-security apparatus since 9/11 must be placed, and in which the practices of solitary isolation have not only shaped the individual psyche of the imprisoned, but which have changed the national psyche and the evils of criminality in ways that have promoted the growth of a carceral state. 4. 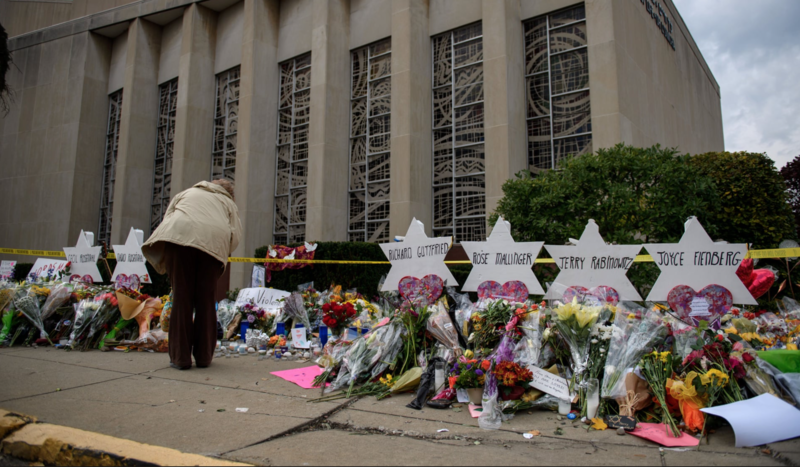 The assassin who massacred congregants in an old immigrant Squirrel Hill neighborhood was motivated, if one can speak of motivations with clarity, by unfounded antisemitic charges Trump stoked that led to unprecedented attacks in a civic or sacred space. The criminal Bowers, before opening fire with an assault rifle, affirmed web-spun deluded call for retribution that the Hebrew Immigration Aid Society promoted the arrival of “invaders that kill our people” from across our borders, this time not “inferior” or “diseased” to our shores, demonizing Jewish aid associations and philanthropists as threats to our social order. The attack of the pipe-bomber on George Soros, widely reviled in neo-fascist Hungary, with globalist thought and pro-migrant agendas, as opposed to national agenda, and cast as an opponent of national identity; Soros seemed consciously placed as first among his list of destinies. The rebirth of a nineteenth-century In trope transmitted odious sloppy thinking promoted across the centuries on social media, now ratcheted up with a nativist twist. Both outbreaks of violence–on the coastal cities and in the old immigrant Squirrel Hill community synagogue–reveal the terrifying power of calls to action from online discussion that had suddenly leaped to men treating the accusations of anti-Americanism as a license for violence unprecedented in American society, with pipe-bomb mailing echoing . From pinning of the arrival of undocumented immigrants on American philanthropist Soros–the target of the first pipe bomb to be reported–or on the Hebrew Immigrant Aid Society, civic space seemed again corroded in dangerous and unprecedented ways. Before Soros had ben a target of the first pipe bomb discovered to arrive in the U.S. Postal Service, which was sent to his home in Bedford, New York, targeted Trump had used social media to link the humanitarian philanthropist to the arrival of anti-Kavanaugh protestors in Washington, DC, and to indicated as the single main source of funding who “was behind” sponsorship of the Ferguson protests, led many conservatives to link him and other American Jews–to a “sinister plot to destroy Kavanaugh” that sought to undermine the state. The unfounded speculation “Soros or somebody” funded the protestors led the anonymous 4chan message board to gloat the President had “NAMED THE IMMIGRATION JEW”–and confirm fears the “globalist” Soros undermined his nationalist America First agenda, a tired trope of antisemitic rhetoric, that extended to aid to the immigrant Caravan from Central America: social media platforms magnified ties between a migrant caravan to Jewish funders including Soros recurred on FOX, NRATV, and were retweeted by Trump’s son, targeting Jewish organizations as promoting the arrival of immigrants who undermine national safety. Soros had no relation to the Caravan, but it became emblematic of a global anti-American threat, a specter of itself. it’s hardly a coincidence that targets of the pipe bombs derived from Trump’s twitter feed. But the demonization of such public targets as criminals–or as associated with criminals–was so strong that it’s no surprise the charge was taken as a call to arms. The identification of enemies of the state didn’t have to travel far off the web to percolate into Bower’s mind and our civic space. The logic of attack outside the law or due process is echoed in the encouragement of soldiers to fire on the immigrants petitioning for entrance to the country if they launch rocks at the armed soldiers who await them at their destination of the border, where they will arrive with hopes for gaining asylum. Increased willingness to demonize immigrants–a more than misguided prospect, drawing attention from our own shores and from the income inequality that paralyzes the nation, and from the global rise of refugees moving across borders–has baselessly and groundlessly treated border-crossings as if they constituted a danger to the American economy and social fabric. The unethical demonization of refugees has already cruelly led to justifications children can be ripped from families, as we imagine impoverished and needy refugees as threats to the nation, although refugees who do stay in America are even pay more in taxes than they cost in benefits or social welfare, and more likely to be active members contributing to society. But the demonization of the “most wanted” and the criminalization of refugees has become a drum-beat of the ongoing Trump campaign. The unfairness of the demonization of the other is deeply pernicious in its costs. If the currency of such charges on social media on the attacks is undeniable, the intense demonization of dangers to national safety and security runs far more deeply in the changing fabric of public space, where mug shots are increasingly displayed in the public sphere from the oddly unmapped terrain of digital billboards as marauders. Such “video walls” make criminals permanently present in the public sphere in video loops, interrupting usual advertisements in a high-impact visual address on the market promoted as a tool for engaging audiences in a powerful “call to action.” If most of the billboards that we see on highways offer an unhealthy body of reading, advertising cut-rate trial lawyers, Powerball lotteries, or gambling resorts, the prime platform of digital boards that since 1986 have promised to deliver detailed pixellated color images to a large number of eyes also offer federal law enforcement The medium able to adjust content by the demands of “real-world conditions” though existing data-feeds was predicted as a tool to promote localized alerts on a new scale this year: if in 2006, only about two hundred digital billboards existed, the outdoor advertising industry promoted 2018 as a year of “the integration of digital signage and technologies into real-world events” which “will not only show messages promoting events, [but] become integral parts of the events themselves,” using a post-modern mantra as a guarantee of their ability to grab audiences’ attention, using the ability of instantaneous transmission to a screen to create visible platforms along the interstate, often identified only by a moniker of crime, as if to dehumanize their identity and magnify their danger. The promotion of an almost unconscious medium for identifying threats to the nation created a new category of by which a threat to the stability appeared in everyday life in particularly aggressive ways, haunting our minds with images of fear that have easily mapped onto how we imagine terrorist threats. If FBI director J. Edgar Hoover devised “ten most wanted fugitives” lists as a media ploy to public assistance while apprehending criminals, the expansion on digital billboards as a means to rapidly diffuse mug-shots of criminals served as a means to increase apprehension and fear that Hoover himself would have welcomed, both for expanding the penumbra of FBI authority in the everyday and directing public attention to the importance of the FBI’s work–civil or psychological consequences be damned. For the prominence of “bad guy” billboards elevates the dichotomous category of dangerous criminals as subjects of public attention and concern, in ways that feed into demonizing bank robbers, rapists, criminals, murderers and abductors of missing children, independently from their individual cases or actual guilt, using the terrifying mug-shots on file to distribute an image of dangerous fugitives in full color and imprint their faces on drivers’ minds. The short clips, haunting images, or rotating shots of fugitives on digital billboards suggest a new prominence of high-visibility criminality in the public eye. The new screens that lie over our roadways, as much as in our palms or pockets, seem to promote the very sort of oppositional thought–as they appear on billboards as animated interjections of urgency, disguised as an appeal for help–that exit at a remove far from the world of the actively “online,” but suggest the huge role of passive internet consumption that is already in our world in public signage. The listing of fugitive Shanika S. Minor of Milwaukee, who in a struggle during a dispute of loud music playing killed a pregnant neighbor, leading the young woman to be included in the “Most Wanted” List for list two charges of “Intentional Homicide”–one being for an “unborn child”–that created a haunting spectacle of criminality that lodged in audiences’ minds, prominently including her in a register of danger where she was soon identified at a southern motel. The targeting of political opponents, perhaps promoted by Trump, perhaps culminates in casting the migrant caravan as “dangerous people.” But the charges of such “bad people” perverting American ideals of safety has deep roots. Trump has convincingly if ungroundedly most recently cast immigration as “very big and very dangerous–a really dangerous topic,” and immigrants as “invaders,” created specters of evil threatening national safety that may have sanctioned heinous acts of violence, in ways that have ratcheted up this rhetoric to new heights. But can their origins like in the proximity to fear that billboards have so successfully staked since 2007? The presence of “bad guy billboards” that are ostensibly dedicated to the collection of tips and civic participation in manhunts has expanded. The billboards have created a new topography of danger for many, even if they are not politically committed, that launched a floating category of ever-present danger into American life. If the dedication of website encouraging hate-speech to growth with out any monitoring or online censorship has been blamed for the diffusion of hateful speech online, even if without access to social media, we find ourselves in the existence of a slew of images of evil actors, lying on the margins of public safety but also inhabiting it, that are perpetuated by the ways that law-enforcement agencies have diffused images of “bad guys” in what were once civic spaces, giving images of haunted individuals’ mug shots a new prominence in what was once civic space as they update law-enforcement techniques in an age of social media. For they essentially generalized a form of apprehension and incarceration outside the court of law, outside law enforcement, and outside prisons. The shift was sudden, and can be dated. When Clear Channel’s vice president, Barbara Bridge, was talking with Natasha Gale Warner of the FBI, about ways to use the digital billboards that generate thirteen different images per minute to best effect, the prospect of “featuring fugitives, the kind you would normally see in the Post Office,” provided the basis for starting a “citizen-action program” in the city that quickly migrated to one hundred and fifty billboards in urban areas, and by 2011, the digital billboards available to post images of wanted felons quickly came to comprise two-thirds of the 2,400 digital billboards across the nation and by 2014 had access to five thousand two hundred billboards nationwide that were designed to reach a broader public and as a tool of public engagement that ClearChannel Outdoor argued could reach an increasingly “mobile population” in ways that seem more alarmist than inviting public participation in identification or apprehension, although that remained their stated goal. While FBI officials have recognized that as many as 25-30% of federal offenders are not limited to records in but one state, recognition of a database of some sixteen million interstate federal records in forty-five state repositories gave rise to the electronic compilation of an Interstate Identification Index, by 2003 holding just under fifty million names, limited to authorized criminal justice, but created a running roadside rogue’s gallery along the interstate as if designed to undermine public confidence, and increase the immediacy of unapprehended criminals or fugitives from the law in an increasingly carceral state. The popularity of the apprehensions of fugitives or suspected criminals that quickly occurred without cost to the FBI suggested a blending of reality television shows like “America’s Most Wanted”–running since 1988, constituting one of the longest-running television shows and created after the murder of the show’s host, John Walsh; if Walsh’s own story already invested the show with the quality of Reality TV, dramatically restaging crimes for the benefit of viewers amplified that sense, and as the show was celebrated for assisting in the location and arrest of over 1,203 fugitives in twenty-five years on the air, the blurring of legal apprehension and television drama grew, first on FOX-TV, and later CBS. The popular show, up to its 2012 cancellation, gave viewers many feel increasingly part of a law-enforcement network, even as it removed justice from a court of law, and the labelling of ‘bad people’ who are exhibited, as if victims of a public execution, as an illustration of the failure to protect or the need to apprehend, creating a sense of criminals, often with their own criminal narratives specified to terrorize the public s much as to convey a reassuring message about law enforcement. Indeed, the apparent crowd-sourcing of criminal apprehension seemed an imbalanced way of outsourcing law enforcement to the public, creating an odd appetite for describing prison escapees, murderers of police, and perpetrators of violent crimes for all ages, that created its own platform for a discourse of law-enforcement hoped to coincide with or met Clear Channel’s profit motive. The image of MS-15 criminals that were diffused by the Trump campaign’s anti-immigrant fears were stoked by the billboards that claimed the ability to identify felons not apprehended but on the loose, and helped many conjure a detailed landscape of danger. and its evil twin, harder to map, the false populism of social media. Trumpian rhetoric before the mid-terms combine fear of terrorism, foreigners, and the arrival of criminal elements from south of the border with anti-semitic conspiracy theories, attributing criminal motives to political opponents with a vitriol that provoked others to launch attacks with apparent abandon. So much seems clear–if the responsibility for platforms is difficult to assign. If the multiplication of such rumors online inspired both odious eruptions of violence, they tap into paranoia deeply terrifying readiness to demonize opponents as undermining civil society. For while it is almost evident that in targeting individuals as national dangers, insistent framing of targets has corroded civil society in its relentless insistence of stoking of paranoia, unclear pronouncements of danger, and threats, inviting an increase of violence that has extended this oppositional rhetoric of “bad guy”–possibly despite the uncertainty of the individual case, or proofs of their guilt. It is striking that an analogous oppositional rhetoric recurs in the proliferation of specters, mug shots placed in digitized billboards, advocating a public sort of retributive violence, that increasingly haunt the interstate. When traveling out of Berkeley, CA–where the absence of civility may be harder to map at times–I was struck by the posting of digital public billboards of wanted criminals, just before the recent spate of bombings has prompted questioning how the corrosive nature of our political discourse began, or what set the scene for the emergence of Donald J. Trump and the intensity of his almost baseless baiting by his personalized taunts. And the proliferation of the photographs that haunt the interstates of the FBI most wanted–as if in an image of the new geography of apprehension–reinstating something of an imaginary map of fugitives across the country, as haunting larger-than-life color digitized mug shots paired with bold-letter charges of which fugitives are accused, placed on the edges of interstates to gain even greater visibility on the new form of publicizing the cases of fugitives–some of whom are readily giving new identifying monikers–that have come to terrorize public space, suggesting a credible image attesting to the permeation of hidden terrorists and deadly criminals who circulate in our midst. The mechanism by which mug shots are directly fed from scanned photographs into easily consumed identifying marks and mentions of heinous crimes provides a running gallery of images dangerous to the social body that will increasingly interrupt the outdoor signage on interstates, presenting a picture of danger in the magnified faces of fugitives for drivers to confront. 7. Billboards were a campaign of placing advertisements outdoors in the 1830s, promoting the tag: “The circus is coming to town.” but the circus is decisively new with the Outdoor Advertising Association of America (OAAA). The billboards showing the mug shots or clandestinely captured images of suspected fugitives aggressively invite the viewer to reconstruct a narrative of the most terrible nature and geography of fear, with additional annotation of their prominent features, size and levels of danger. The prominently placement of rougish figures go hand-in-globe with the profit motives of companies like Clear Channel, who have granted additional space to the FBI for first-degree murderers, rapists, serial bank robbers, and other suspicious figures, giving huge exposure to large, color images of how their faces addressed the camera in mug shots. Their faces have come to haunt the public imagination on our interstates, directing drivers’ visual attention to such outsized signage by haunting images of accused “bad guys” in such “bad guy billboards” that have hauntingly been naturalized as a landscape of electronic advertising as we travel on the road–demonizing outsiders of the social body as enemies of the people, whose magnified images glare down on the interstate, as so many demons. Although the practice first began in 2007, after a test-run in Philadelphia, the City of Brotherly Love, display of such stand-alone images of criminals on the loose constituted a roadside rogues’ galleries on Clear Channel billboards nationwide created a vertiginous sense of proximity to violent crimes committed by individuals, stigmatized as outcasts from society in increasingly dehumanized ways, and creating a false proximity to national news stories. Such images have introduced in concrete ways a sense of danger in the national psyche, even as they were promoted as a basis for civilian involvement in criminal apprehension–“bad-guy-catching billboards,” advertising agencies assured us. For such public images have created a new sense of public space, filled with fears of the foreigner who lies outside the borders of propriety and safety, creating distractions from the inequalities within our society, or the tremendous growth of our carceral system–of which they are an only partial reminder. The practice of listing the “ten most wanted fugitives” began when it was institutionalized by FBI Director J. Edgar Hoover to seek public assistance apprehending criminals, that have only expanded as a means to increase apprehension and fear. Much as Lee Atwater adopted the strategic use of images of the a furloughed convict–with the scarier name “Willie Horton” to trigger racist fears of the criminality of a prisoner sentenced to life without parole to distract from the Bush-Dukakis race, blaming Dukakis for having allowed Horton to leave prison on a weekend pass as if it were a personal decision–to make Dukakis sound far easier on crime, the dispersion of billboards of federal criminals has broadened a geography of fear and terror across many states, using images targeting hardened criminals to generalize fear. The same tactic, recently adopted in a web video designed for social media and posted on Trump’s own Twitterfeed, featured a Hispanic criminal, Luis Bracamontes, a murderer who crossed the US-Mexico border, demonized to generalize a border anxiety by summoning fears of the Democratic party’s relation to the approaching Caravan that Trump has evoked as a national threat on the eve of the mid-terms election. But did the emergence of a new landscape of danger not grow through the nearly routinized portraits of such fugitives, and the implicit involvement of the nation in their apprehension, with implicit understanding that they would receive the death penalty? The celebration of the relative success of apprehension of fugitive cases–tied to the federal embrace of social media, twitter, and the internet as a way to involve the public in tips for apprehension of criminals, has technologically changed with the rise of digital billboards as a venue to “communicate with the public” that have led to a rapid turnover in apprehension–at times within hours, counting criminals who turn themselves in, so defeated by seeing their images–that seem to have staked a psychological sort of warfare against the public. To be sure, social media platforms that have advocated “free speech” have afforded platforms for targeting of individuals by hate speech–and given rise to the under the guise of presenting ‘alternative views.’ They have created spaces for the virtual camouflaging of odious anti-semitism, racism, and for the promotion of hate-speech, which, squirreled into our civic spaces in unpredictable ways and led to the encoding of new banners for fringe groups. As John Herrman observed in 2017, in a post-mortem of “Unite the Right” that reflected how right-wing programmers, have come to occupy online terrain in reaction to perceived “censorship” of profit-driven servers, and created “free speech” alternative media platforms, dedicated to not hinder “alternative” viewpoints against Silicon Valley’s perceived political correctness, the ways that such sites have relaunched charges of foreign danger, and waged campaigns of outright fear, may have found a basis in the growth of “Most Wanted” billboards that made threats to public safety all the more prominent along the interstate, allowing many to imagine with greater concreteness their proximity to and presence in public life. 8. A landscape of ever-present danger appeared to spread across the nation was echoed in the occurrence of a set of pipe-bombs of mysterious origin that punctured the news–first one, then three, then ten, now fourteen or fifteen–arriving to targets of political violence, if not terrorism. And so the expanding map of the sites where ten–and then fourteen–pipe bombs had arrived–an unclear set of relations, without any real meaning–suddenly seemed meaningful for the broad dissemination of hatred, and as outcroppings of unexpected violence even if they told no story and the narrative function of the maps–although the roll-out of a bomb sent to and targeting George Soros’ home, and then one to Hillary Clinton, CNN, Maxine Waters, and also Eric Holder, expanding as if designed to ratchet up fear to a new level of nation-wide panic and uncertainty, although delivered by USPS and sent by one man in Florida, created a national landscape of uncertainty. The spread of such attacks–which were tragically followed as if spontaneously by outbreaks of racist violence in Kentucky and Pittsburgh–both disturbing, execution style events–had no real clear ability of mapping, but suggested the distorted white nationalist images of the legitimation of violence as a response accepted in civic space. There is a sense of the unmaking of the map–and the fear of a collapse of civic discourse–in the proliferation of such a scattershot violence of designs of destabilization–in how these maps point to the arrival of pipe bombs in disorienting ways. Their disorienting effect of replacing the nation with a map of the eruption of violence–even intended violence–suggest a destabilization disrupting the fixity of a map of a nation, replacing it with a maps of sites of violence in ways that are insufficient to express their tragedy–which suddenly lack coherence or legibility, as violence isn’t able to be meaningful located in any one place, but suddenly seems loosened everywhere, as if to threaten to disrupt the coherence of the state. Recalling the tortured logic of a bomber who sought to spell out a message in the map of the nation, the bombs were a threat to the coast elites–Soros; Obama; Clinton; Holder; Waters–or a Trump supporter’s received imaginary of a coastal elite, although one wonders Michael Moore didn’t, as FBI officials feared, receive a pipe bomb in the mail as well, as he was shown in the trigger hairs of a gun in the posters on the suspect Cesar Sayoc’s white van. –but not the quite bizarre crowding of decals and pro-Trump signs that the FBI sought to cover up and preserve as they transported the van where the bombs had allegedly been packaged and sent, treating it as the site of crime. Or is the site of crime not far more dispersed, lying not only in the internet chat rooms where Sayoc spent time, but in the demonization of individuals as national dangers? Did they seek to dislodge the terrifying project from how Trump had so toxically indulged in targeting individual opponents on social media with abandon, as if intentionally to transform our civic space? The owner of the van who sent the pipe-bombs, Cesar Sayoc, had, after all, seemed to barricade himself in a fantasy world of fake conspiracies–spookily violent photoshopped images; odd symbols of imagined solidarity; demonic caricatures–and seemed to have basked in the rhetoric of Trump’s campaign, which he’d adopted to define his orientation to the world. Sayoc, a part-time pizza delivery man, seemed to find a new sense of himself, and penned a far longer list of those enemies of the Trumpets state he planned to progress systematically–although he only mailed fifteen pipe-bombs before being apprehended by the FBI. Were the other members on this list–already including Hillary Clinton, George Soros, Maxine Waters, Barack Obama, CNN, Eric Holder, Cory Booker, James Clapper–also so prominently targeted in Trump’s twitter feed? Sayoc seems to have seen his project as a part and parcel of Making America Great Again, even if he was careless enough to leave one fingerprint on one pipe bomb, and used the same sort of creative spellings he used on social media, providing a crucial connection for investigators who tried to piece together the crimes. But the intent to unbalance the nation with a sense of geographically wide-ranging pipe-bombs–an old fascist tactic of anonymous assassination and destabilization–seems to have been timed to prepare for the midterm elections, in order to tip voters with the memory of terrorist attacks that would foster a climate of fear. The unresolved question of complicity, if hanging in the air, and refuted by America’s Supposed President–“SPOTUS”–was all too scary, as it seemed clear that it couldn’t really be mapped, after all, but reflected the power of epithets and injunctions to transgress the law and all civil codes, by taking things into one’s hands when necessary. It seemed for a moment far less systematic than a list, but a scattershot fashion, although several of the located fifteen packages included, even if the PVC pipe bombs with batteries, timers, and shrapnel were not all rigged to explode, color photographs of their destinatees, over which Sayoc had drawn an “X,” as if with a red sharpie, to mark them as his targets as he went through his list. The FBI adopted a Digital Billboard Alert Network to upload photos and basic case information that loads onto pre-approved FBI digital billboard templates, in hopes to reach a wide audience with news of its most wanted, and to strike fear into felons. In an age when almost everything is pixellated, the Bureau gained “access” to over 7,300 electronic billboards across 46 states, creating a broad dragnet of alerting motorists to fugitives and provoking up to thousands of tips–the Las Vegas shooter culled over 4,000–and providing a vicarious participation in manhunts that seems unhealthy in its intent to openly traffic in fear, as prominent “amber alerts” but with even more terrifying proximity. The immediate distribution of mugshots in electronic form to OOH companies, able to display them within the geographic parameters where a fugitive is suspected to have fled, has provided what is billed as a new form of “civic involvement” in the Most Wanted list. Lending of billboards to federal agencies to post images of suspected fugitives created a new set of tools for their apprehension, it has created a geography of fear, creating a sense of immediacy to suspected criminal perpetrators on the loose. The system serves to publicize 10 Most Wanted fugitives in prominent positions along the interstate, and geographic definition of where they are deployed casts both a broad and a precise net of surveillance in hopes to create a “dragnet” of citizens for cases where criminals are on the loose, potentially commanding broad attention of millions of potential observers at an instant, diffusing images of danger and promoting fears of unapprehended felons in our midst, akin to shouting fire in a crowded theater–in the sense that it may raise questions of the promotion of “clear and present danger” not because they are inflammatory remarks, but as they unduly abuse the status of federal authority in order create a geography of fear. In ways, the powerful mock-ups that resemble memorable television screens, “alerting” citizens through fragmentary narratives of a set of crimes and striking images of suspected criminals, alert viewers to a sense of social instability, and to prepare drivers for receiving emergency alerts: in an age when all that is solid is pixelated, digital billboards not only have come to provide a means for publicizing images of feared fugitives. But the the fungible contents of digital signage, unlike its static precursor, allows federal law enforcement even to pre-empt advertising contents in the need for emergency alerts. In this manner, a flurry of messages about Dzhokhar Tsarnaev, the Boston Marathon Bomber, were widely diffused around the Boston area in 2013, as a way to involve as many as possible in tracking him down. The criminal whose image is spread so widely quickly gains their own criminal identity, even as the digital billboard images only identify them as “suspects” of an attack. Indeed, these spectra images that haunt our freeways were amazingly striking when I travelled to New York, partly in a state of shock, and returned, passing digital billboards that posted the staring faces of criminals on the highway that passed Newark. The flickering images that passed on a billboard lodged in my mind, in a particularly haunting fashion, and suddenly intersected with my own thoughts and attention for a moment, introducing not so much fear, but a shocking lack of empathy or ability to understand the faces on the boards that ran by the windshield in the grey sky, drifting away into the past as we rounded a bend, but remaining in my memory, aggressively suggesting the new geography of criminal apprehension, as much as the forms of “civic involvement” that these digital billboards posting images or short films segments of accused felons are argued to create. 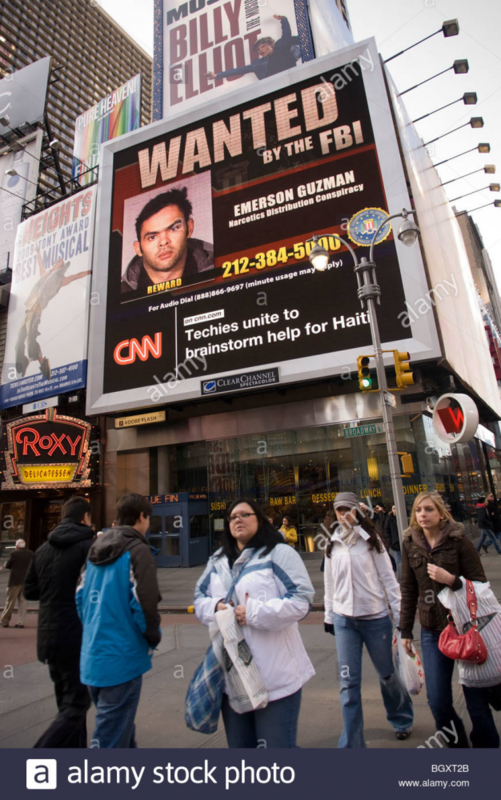 ClearChannel global President Paul Meyer was happy to announce in 2007, a decade ago, that his company reached an accord with the FBI for a new form of diffusing such digital billboards of the most wanted fugitives in geographically targeted audiences. The program of digital billboards that has emerged to haunt our interstates were first rolled out in Cleveland, Ohio, as messages able to pre-empt paid advertising on digital billboards if need arises, and to allow unrented billboards to be used by the FBI program of criminal , which later expanded to regular updates man hunts, as for the Boston Marathon bomber, in ways that have undoubtedly changed our public attitudes to law enforcement, and broadened our apprehensiveess and sense of national fear. The medium offered a way to affirm the authority of the digital billboard and to broadcast an urgent message to the public. When it was first used by Clear Channel along the major roadways in Cleveland, Akron, and Columbus, it was celebrated for the efficiency it provided in immediately diffusing disturbing messages of fear, enabling mug shots of criminals, photos of kidnapped or missing children, to cycle on screens of considerable visibility in eight-minute spots that took advantage of billboards as the venue to post publicly fugitives from the law. The billboards provided a basis to circulate images of fugitives for the first time to a broad an indiscriminate public, in ways that still haunt drivers’ and passengers’ minds of all ages with the images of criminal elements who are designated fugitives from the law, but using the barest of outlines of the crimes they are charged as having committed to conjure a broad landscape of criminality along the interstate, that odd space of anonymous crowding that is often even denser at the present than it had once been in the recent past. The rising salience of such roadside digital billboards flash charged images of un-apprehended alleged criminals–fugitives from the federal law–that recall some of the oldest “WANTED” images of the American West or US Post Offices, but conjure a specter of our national vulnerability combining an early modern identification of the other, and advocacy and acknowledgement of a need for retributive justice, and a nineteenth-century image of criminal classes of Lavater and Cesare Lombroso? If these images are without interpretive scientificity, or clear guidelines to read the faces of the accused, they seem designed to send subliminal messages able to penetrate the subconscious, and provide examples of the offenses that merit capital punishment, an artifact of the nation we have continued to keep. Placed not in defined spaces as Post Office walls, but rather confronting drivers who speed along an open road, they remind us of the possible proximity of dangerous threats by vivid mug shots, and seem to almost dull us to the landscape of violence around us. To bed sure, the billboards are encouraged by victorious proclamations that they had led criminals been identified soon after their photos circulated on digital billboards–calling into action and mobilizing a “citizen justice” that is not rooted in vigilantism, but seeks to invite citizens to contact the police number or website depicted on them to encourage their participation in the arrest and jailing of potentially violent men and women, shown not only as monsters, but some of whom even are shown as akin to Frankenstein. Such images led to the broad generation of tips, and provoked, after the October 1 mass shooting in Las Vegas, allowing them to cull over 4,000 tips, in ways that have lent legitimacy to their display as modern tools of crime-fighting, designed to speed up the apprehension of futivies who committed cases of violence that has broken forth in our landscape. Although some injunctions have been made against Clear Channel Outdoor from placing digital billboards in media-saturated areas of Los Angeles and Hollywood-deals that were hugely lucrative to the city–but as a deal that conflicted with the ban on further billboards in the advertisement-saturated city, which had in 2006 allowed Clear Channel already to convert some 840 static billboards to displays of digital signage, even if they limited the further billboards in the city by reducing existing billboards. The move to gain a prominent place in the intense competition for airspace–their competitors had objected to the deal, and if they won their case did so only after Clear Channel had already placed a slew of a hundred digital signs in the city, some of which gestured to the new genre of mug-shot wanted signs. –the dominance of such billboards raise questions of whether it’s ethical to lt law enforcement images to migrate onto a terrain of advertising, and into public space, addressing mass populations in quite openly aggressive ways that seem to naturalize a geography of violence about them, and transpose the setting of a mug-shot from the fixed sectors of a post office to the public road? Is the promotion of the imagery of thugs only a way of encouraging the social identities of thuggishness–and the demonization of the other, and of a criminal class for which one might just as easily substitute the members of the political class, and indeed one’s political opponents? 10. Did the geography of such digital billboards displaying fugitives wanted by the FBI create a new sense of our public sphere? The boast of spokespersons for the Outdoor Advertising Association of America that this most time-sensitive & flexible form of outdoor advertising might double as a form of psychological warfare against criminals, who may end up “just giving up” since they “feel they have nowhere to go” [sic], omits the deep effects that they might have on not only the American electorate, but children who processed their presence as part of a landscape of law enforcement that entered their lives. –that allowed the targeting of specific criminals to specific stretches of the open road. As part of a broader effort from 2016 “to meet marketers’ demands,” digital billboards promise to “blend ads tech and smart media with human intelligence,” a “technology intelligence” unveiled nationwide under the name Clear Channel RADAR–promising a” suite of research, data and analytics tools to help advertisers and agencies more” able to “tap into data-driven mobile audience insights” in the company parlance; this translated to “Clear Channel Billboards Go Big Brother, using billboards to map real-world habits from customers, and billboards to act as two-way screen amassing aggregated cell phone data to allow the company to monitor the movements of consumers, to reach the desired audiences with greater accuracy.) the data analysis billboards that Clear Channel to “see” people who have ‘seen” their billboards is claimed to be both anonymous and secure, but sets a new threshold for outdoor media, designed to refine advertising markets, but creates such a highly detailed dataset of consumers’ profiles without making any guarantees about sharing such information with other companies. Does the same sort of unwanted surveillance allow them to target mentions of the images of fugitives or suspected criminals, violating both the privacy of mobile users and the privacy of those suspected of crimes, potentially even after charges have been dropped? The sense of such surveillance seems prefigured in some way in the faces of those fugitives, staring out of the billboards, like a reflection of the huge increase in mass-incarcerationthat also exists across all fifty states, and had so grown by around 2007, and even a decade earlier, in 1997, as state prisons an local jails have come to hold the most dramatically increasing proportion of prisoners, especially in the South and southern states, but also in California, which seems to mirror closely the incarceration rate of all states–and mirrors the recent reduction in how overcrowded state prisons led the U.S. Supreme Court to reduce overcrowding in state prisons as unconstitutional, and shift prisoners to local jails, which are both exempt from the Supreme Court decision. 11. The increased presence across California of such billboards stands only to grow. The planned digital billboards to be constructed along highway system are a striking map, showing a large number planned in rural regions, as much as in more densely urban areas–where you would suspect them to be for greater revenues–and many along the I-5–but closer to regions where prisons were built. While incarceration rates may be a poor proxy for FBI Most Wanted Criminals, they create a geography of fear–a geography that seems supported but the growth of a plan for increasing digital billboards across the Central Valley. The plans for an increase in digital billboards dovetails strikingly with the rise of central valley prisons and centers of incarceration–and indeed the geography of incarceration that has grown in California and across the United States. –and stand to generate the sorts of unexpected announcements that are able to be telegraphed to those on the road, and the dedicated lines and rewards they are promised, as if a new form of state lottery, by politicized messages. –exploits the authority of the elevated advertising platform to assume an air of authority of public consensus, reflecting the divided nature of the public space where we now live, by asking one to define one’s relation to the nation, that suggests the criminality of taking a knee as if it were an object of disrespect that dishonored Prisoners of War or Missing in Action in overseas combat. Was it a coincidence that the preponderance of FBI fugitives pictured as “WANTED” were African-American, and that the billboard in Orange County gestured to a Black Lives Matter protest that it sought to place on the criminal periphery of American society? 12. It is not unreasonable to advocate yet another reason for purchasing ClearChannel as a necessary avenue of resistance in the Age of Trump, as appeals to millionaire such as Tom Steyer, himself the recent target of one of Peyoc’s pipe bombs, urge–as Trump has targeted him as a “crazed & stumbling lunatic.” The proposal might well make sense, and would be playing defense. Given that the Heritage Foundation has long funded radio commentators such as Rush Limbaugh as an “investment” to the tune of two million in the Obama years, and “invests” another 1.3 million in Sean Hannity, the rationale that a philanthropist billionaire as Steyer purchase Clear Channel’s‘ broadcast networks could include those proliferating digital billboards that blast undefined messages of fear across America, reviving old specters of kidnapping and amplifying fears of national vulnerability to terrorism. Clear Channel isn’t new to the game political propaganda. The group famously invited Donald Trump to speak publicly on his own syndicated radio show back in 2004, allegedly in order to meet an insatiable appetite for Trump’s wisdom for as “the public’s appetite for Donald Trump’s sharp, sage commentary has never been bigger.” Clear Channel Radio launched the Donald into the subconscious of America and allowed him the venue to hone his rhetorical skills as much as Trump’s own attachment to FOX News since 1996, before”Mondays with Trump” ran from 2011, offering the Donald on-air time to calibrate his relation to the network’s national agenda, and develop an uncanny ability to become the “ratings machine,” able to amass abundant air time throughout the primaries and general election–and even to redefine the format of debate. Both helped the Donald cathect with a broad audience often apathetic as much as excluded from the electorate, previously rarely part of the platea, and to do so in ways that eluded his interviewers. The corrosive nature of our pubic discourse was brought to mind, if it needed to be yet again, by the drama of a number of pipe-bombs targeting Democratic politicians and those identified with their support. Even when we didn’t know the origins of the pipe-bombs sent to those figures President Trump regularly took to Twitter to single out and target as punching bags had originated from a van in Florida by a deranged Trump supporter–and didn’t know the packages would all be intercepted or were the work of a lone provocateur–the possible motives or designs of their arrival became a story in itself. The question of their origin was able to migrate with amazing power to migrate from talk radio, fringe website, to the public statements of our White House and Supposed President, who demurred on the targeted nature of the destinees who were had been targeted as voices of a Democratic party, and revealed a terrifying eery lack of a position of moral authority to condemn their arrival, they already seemed to suggest the spread of an unconfined violent hatred in the nation, launched as part and parcel of a similarly dehumanizing rhetoric that has excused violence as a legitimate response in a public sphere to achieve a white nationalist dystopia and denigrate all verbally stygmatized as if they constituted threats to the nation–indeed should be acknowledged to destabilize national security, and merit responses that lie far outside the law in this new state of emergency.. The placement of these images beside an image of President Trump, who had cast all as his opponents, riding helmetless atop an armored tank–beside “Top Youth Soccer Recruits for Trump,” in a bizarrely twisted image of athleticism echoing the Hitler Youth, beside an image that invoking the need for violence to silence Trump’s former opponent in the 2016 election for U.S. President, who would be the second destinatee of a home-made improvised pipe bomb. One only had to read the overlapping signs that shuttered the van’s windows for an approximation of the mental map from which they originated, after all. The stigmatization of a source of evil and criminality within the world seems to have descended on American politics with a vengeance, as from another planet, the suggest its inhabitant fell into the blogosphere or twittersphere, as if the rhetoric of Trump rallies and Rush Limbaugh had condensed within the doors of a white van whose occupant had plastered its windows with bumper stickers and a new generation of oppositional political paraphernalia as if to sequester himself within another reality hard not to call Trumplandia, filled with celebration images of trump claiming the Republican nomination, Vice President Pence with thumbs up and beside Trump in a political poster, and Trump astride an armored tank decorated with his name, in the manner of a luxury hotel, oversized apartment building, or gold-plated tower–and the favorite targets of his speeches suddenly shown within crosshairs, from Hillary Clinton and President Obama to Michale Moore and Jill Stein, as if these were the actors in this new drama of the return of white supremacy. 14. 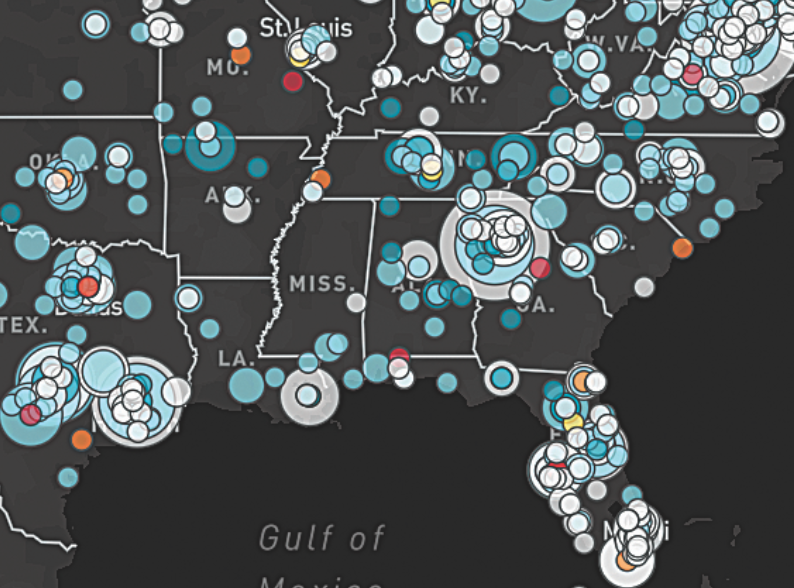 The new plague of violence perhaps just couldn’t be mapped by geographic tools. 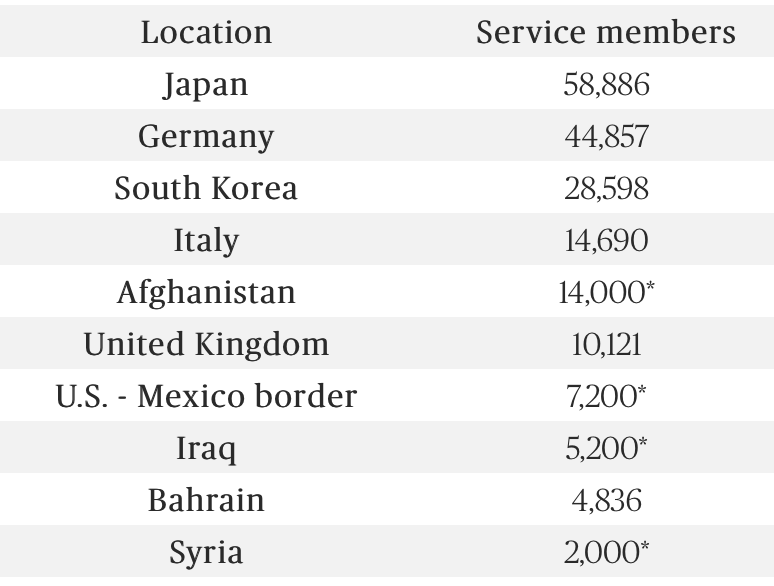 Auden reflected on the wartime transformation of a gentleman’s Baedeker map to sites of mass-killing in World War II as remapping of the known world, as new mechanisms for death–and what he called “private massacres” of mass-murder on an industrial scale–has replaced the map of nations with a new monumentalization of war. There are now sites of true, undeniable evil, he suggests. We now see them on our screens, not in one place, but everywhere, and spilling out into civic space. For the mapping of for-profit electronic billboards of the faces of has personified the danger of individuals, in roadside specters, an expansion of our growing prison state, as mug-shots of “bad guys” have become a surrogate for the demand to expel the unwanted and dangerous from society. The remapping where the coherence of a map is replaced by the sense of an absolute evil of violence–“Maps can really point to places/ Where life is evil now:/Nanking: Dachau“–may perhaps only be transformed to poetry to gain coherence or legibility. But as wartime violence wasn’t able to be meaningful located in any one place, but suddenly seemed everywhere across the globe, and resists the ability to map with any coherence. If less of an absolute evil, something distinctly evil has occurred in the terrifying targeting of individuals out of a deeply distorted sense of danger, fear, and perceived threats. The diffusion of sites of evil in roadside specters almost celebrates involvement in a prison state, using the profit-motives of purveyors of electronic billboards as a way to direct public attention to suspected fugitives, diffusing mug-shots of “bad guys” as worthy of being expelled from society. One place to begin to describe the corrosion of civic responsibility or a civic discourse might begin with the expansion mug shots of criminals on digital billboards along freeways and interstates and airports, and the geography of danger, fear, and apprehension that have begun to haunt the public sphere with unprecedented proximity and ubiquity at the start e of Barack Obama’s first term, as mirror image of the increased expansion of incarceration and of a carceral imaginary, that have led to a nation in which 2.4 million people live behind bars, and a total population of 7 million supervised by adult correctional systems. 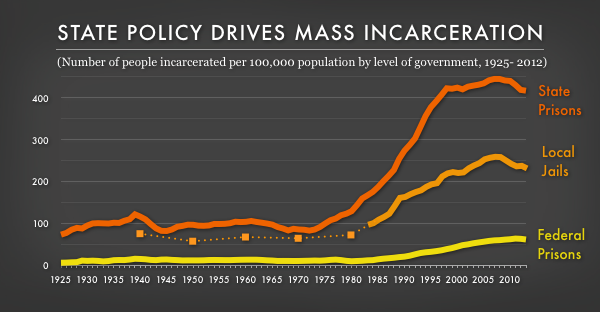 The numbers of federal inmates soared since the 1980s by almost 800%, making the United States government the world’s largest jailer, in ways that deeply distorted our public civility or ability for civic discourse. Near the year that incarceration rates peaked, by no coincidence, at about 950 men per 100,000, the notorious arctic elf the public display of mug shots, both on digital billboards and online, began to haunt the American imagination. Digital billboards began to diffuse stoke public panic by 2013, both of unaprehended federal criminals and of domestic terrorism, complete with fragmentary rap sheets. Billboards invited citizens to contribute information but present alarms as if to trigger panicked fight-or-flight responses among those behind the wheel in much of the nation, as much as public citizenship. Indeed, the growth of the constellation of the medium of electronic billboards, if hardly seeming a break from the past, were championed as the new voice of business by 2006, the year before the placement of images of fugitive felons began. By then, Clear Channel, the largest manufacturer of billboards, began to break into the LED electronic billboards as ways of reaching a growing market of “vehicle demographics” than Lamar Digital Displays, who had deployed 150 in some forty individual markets by the summer of 2006, concentrated in th midwest and in the southeastern coast, investing in a “national billboard network” on its way to national coverage. The constellation of images becomes a set of “bad guys,” or Halloween monsters of the sort that we all too often enjoy being scared by, stand-ins for the levels of social disfunctionality that we find across the nation–homeless; uninsured; veterans without medical care; unemployed; displaced immigrants–and bogeymen that we can easily substitute with “others” from immigrants from south of the border who are viewed as threats to foreign terrorists. Is it any puzzle that the rhetoric of hidden dangers exercised such wide appeal as they are designed to be triggers for increased fear? The change in the national geography of digital billboards was unprecedented gave a physical presence to a fear of the spread of criminality, even if it was trumpeted as a tool of locating offenders, with the expansion of the FBI’s digital billboard initiative, which allowed everyone to experience proximity to missing children, rapists, and criminal narratives in far more panicked detail than the back of milk-carton boxes of the past. 14. The increased interaction with digital billboards that grew up in American cities just before “America’s Most Wanted” was first cancelled, and the audience for digital billboards may have amplified the sense of participatory apprehension of violent criminals that the television show had created. For the show offered a distorted sense of the presence in American communities of wanted criminals, whose mug shots haunted drivers’ imaginations, and defined a surreal sense of the topography of urban danger, as Clear Channel alternated its banner announcements of mug shots in Newark NJ, Los Angeles, and Tampa Fl, and much of the South, as well as Akron and Albuquerque, for violent crimes, drugs, ponzi schemes, bank robberies, and murders, so that all screens run mug shots of the Most Wanted until the screen is sold to an advertiser, as if to feed a thirst for on-the-edge fear designed to provoke or to satisfy the generation of an instinctive Pavlovian response, creating a rush of adrenaline or endorphins by imagining oneself face-to-face in confrontation with a hardened criminal. Or is it a basis for undermining public confidence, and sewing a deep sense of uncertainty within the public sphere and civic responsibility? For the emergence of the digitized billboard as a sphere of displaying mug shots is nothing less than a redrawing of public space. The increased expansion of digital billboards to featuring short eight-second spots including the photographs of missing children, as if to increase their dramatic intensity, raises questions of the sort of alerts and scenarios of danger and the need to take justice into one’s own hands that the billboard provokes at the same time as Donald Trump has been leading a call against the alleged gang members from M-16 who he and Vice President Pence assert lie among the Caravan of Migrants approaching the United States’ southwestern border, and the fears of the arrival of further individuals cursed with criminal records. The public display of criminals’ face–below capital letters proclaiming “WANTED” or “ARMED BANK ROBBERY” or “DRUG CHARGES” are valued as generating the “environment where a criminal has nowhere to go,” and may turn themselves in, but creates a sense of panic and even if the FBI warns drivers that they should only take the time to call the telephone number printed after stopping their vehicle, the deep sense of fear and of unapprehended criminals evokes a fear of a failure of protection, vulnerability, and fear, veterans of backgrounds in Reality TV seized upon to perform. The proliferation of the genre of mug shots was not only on billboards. The genre has grown in online editions of newspapers and in print alike, leading to the growth of mug shot galleries print and in perpetual circulation online, whose after-life constitute an invasion of privacy that is over-ridden as they have become a magnet for web-traffic, and popular click-bait for chains of newspaper who recirculate images provided by police, even before charges had been brought against them, in ways that tar the individual in permanent ways; the identification of only the name, crime for which charged, and age give the outlines of a story for readers to assemble, much as the billboards, and are able to constitute seriously compromising invasions of privacy–even if newspaper as North Carolina’s Salisbury Post, acknowledges that it prints accusations, and may print follow-ups on the cases, the narratives the photographs create can compromise the individuals’ livelihoods and careers; one paper in Colorado misidentified 39 mug shots it had published as a busted-up drug ring although the accused had been framed. While Cleveland.com has chosen to scrub its archives of mug shots and names of many convicted of committing minor crimes, if they ask, the procedure of public shaming seems an extension of the electronic billboards, pandering to curiosity of readers, as much as providing use, recycling images from police blotters to create print copy even of minor drug arrests, leading to pandering to the tastes of readers without much purpose save a readiness to offer a vicarious quasi-sadistic pleasure through galleries of those arrested for even minor crimes. Increasingly, tens of millions of mug shots from legal arrest have been taken from public records sites, in order to be scraped and embedded in commercial websites to serve as click-bait. For Americans habituating to interacting with images of criminality, there has emerged a market met by shady websites like mugshots.com who transpose photographs of police bookings, without concern for rights to privacy. At present, the incredible number of 40% of American newspapers to include mug-shot spreads–even as crime rates are declining–as if to meet the need for ready information on the state of or an opportunity for Schadenfreude that provides a sort of ritualized humiliation of the worse off. The demonization of the criminal in FBI-Clear Channel cooperation billboards, which now run both Amber Alerts and provide memorials to fallen police officers, still give Warner a “ping in her heart” as she considers her role in the program, and create a twinned sense of surveillance and mass-communication, if not an invasion of privacy, that lead murderers to exhibit the same shot in over seventeen states at the same time, as if to generate a state of perpetual fear, for figures such as the “Grandad Bandit” or “EastCoastRapist” who fed an addiction to ominous figures of almost cartoonish proportions, as if designed to denigrate the level of public discourse. The sense of defining these “most wanted” figures as targets that drivers might have seen seemed increasingly credible. But as the effectiveness of the posters displayed were celebrated, their popularity has grown. The first hundred and fifty digital billboards showing criminals produced in Ohio in late 2007 were so successful at quickening apprehensions that the FBI assured more would be “coming soon to twenty major cities nationwide,” including signs able to place “high security messages” in “strategic locations” so that they can be “seen by millions driving by each day.” The purpose of such digital billboards was boasted to depend on the general public, but seemed a new form of re-education–“If you recognize one of the fugitives while driving by a billboard (and please drive safely! ), please call the posted number as soon as you can after stopping.”–as if the eagerness of apprehension and of claiming a reward might provoke problems among drivers of its own in the eagerness to pass the information on first for the reward; the FBI promised to “highlight those who we’re looking for the most in a given area: violent criminals, kidnap victims, missing kids, bank robbers, [and] even terrorists.” The failing postal service was, after all, just doing “its job,” and the FBI promised to get up the billboards in each region as soon as possible.